What’s your stance on keeping secrets from your guy? Ask ten different women that question and you’ll get ten different answers. Some are advocates of sharing EVERYTHING, while others want to maintain areas of privacy, even in a serious relationship. You probably have friends at both extremes. I share a lot about my personal life with a coworker and friend named Jane. But I know she’s going to tell her boyfriend, Steve. Telling Jane is basically telling Steve. I’m not kidding. My friend Sharon, on the other hand, is a vault. If I tell her something in confidence, she’ll take it to the grave. Even if her boyfriend walks up and asks what we were just talking about, she easily sidesteps the question if she feels it was my information to share. Most of us live somewhere in the middle, making on-the-spot decisions about what to share as situations come up. But that can produce a lot of anxiety. 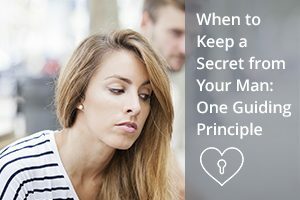 Sometimes keeping a secret feels a bit too much like lying by omission, even when the secret isn’t “bad.” And if your significant other pushes you to spill the beans, it feels awkward to keep your lips sealed. Fortunately, Markman has some advice that makes it easier to know when we should keep secrets, and makes them a little less burdensome to bear. It’s all about realizing that sometimes it’s beneficial to withhold information. Even from your man. Most of the secrets we keep are for protection — either for ourselves or someone else. With that in mind, here are some guidelines for determining when to share something with your guy and when to keep things to yourself. If sharing will hurt either of you, don’t tell. Suppose a friend confides in you. She tells you she’s dealing with an intensely personal situation. It has nothing to do with your man. Telling him will hurt you because it will hurt your relationship with your friend. There’s really no reason to tell him, so don’t. Instead, honor your friend’s trust. If sharing will hurt the development of the relationship, wait. What if you have a secret, something from your past, and you’re afraid it will color his impression of you? It’s okay to keep that kind of thing to yourself for a while. At least until there’s a solid foundation of trust between the two of you. Ideally, you’ll be able to share those things with him in the future, but you certainly don’t have to disclose every skeleton in your closet on the first date! Some secrets will only damage a relationship. Say you broke a promise to him, but he doesn’t know. If he ever finds out, he’ll lose faith in you. Plus, it will stress you out maintaining the cover-up. He may be upset, but as long as it wasn’t a huge breach of trust you can talk it out. That will ultimately help the relationship. The key is always to ask yourself a fairly basic question. What truly protects you, him, and the relationship? If you focus on what will build and protect your relationship, it’s a lot easier to know when to tell him everything and when to keep a secret to protect the people involved. [i] Markman, Art. “This Is The Secret To Keeping Secrets.” Fast Company. Mansueto Ventures, LLC, 31 Mar. 2016. Web. 30 June 2016. This entry was posted in Dating, Relationships and tagged secrets, trust by James Bauer. Bookmark the permalink. Im eager to know everything about these relationships because l am experiencing exactly as you shared….I don have money To receive advices but l need the help.I am in a bad situation right now…I dont know wat to do. That said, most people are fairly aware of their reality and surroundings and don’t always need a reminder of a good or particularly bad experience in their life. What doesn’t kill you only makes you stronger. Great post! I agree, I am an honest person to a fault sometimes, I would rather tell my partner the truth than keep a secret that eats away at me. Although I am great at keeping other people’s secrets.